2. Take Hualien bus at Hualien train station - the 8:50 a.m. bus from Hualien to Lishan, which will pass the center around 12:00 p.m.; the return bus leaves Lishan at 15:00 p.m., and pass the center around 16:20 p.m.
3. 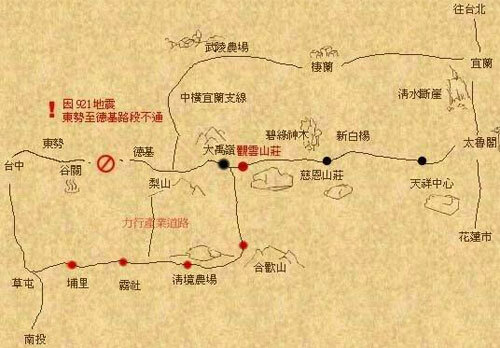 It is recommended to come in your own transport as there are few buses in the mountains. If you are catching a bus, please ensure you get to the center entrance early to avoid missing it. ※ 3. It is recommended to come in your own transport as there are few buses in the mountains. If you are catching a bus, please ensure you get to the center entrance early to avoid missing it.